Pockrass will begin with Fox at Daytona Speedweeks in a couple weeks. 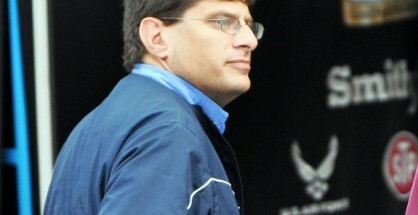 Bob Pockrass will never say this himself but he is one of the most respected and most trusted motorsport journalists in the industry. Sometimes, being trustworthy results in being asked the same questions over and over but that’s because NASCAR fans know that Bob knows what he’s talking about and will give you a straight answer. A couple months ago, Pockrass revealed that he wasn’t going to remain at ESPN and the NASCAR Awards Ceremony was his final event. ESPN has had layoffs off-and-on over the past couple years and considering ESPN doesn’t have NASCAR rights, shrinking their motorsports staff was possible and thus Pockrass’ tenure at ESPN was over. But unlike many other stories about great media members being out of a job, this one has a happy ending. First reported by Sports Business Journal’s Adam Stern and confirmed by Fox Sports themselves, the company has hired Pockrass to be a “NASCAR insider” for the 2019 season. Fox notes that Pockrass will be on their NASCAR linear and digital platforms starting with Daytona Speedweeks in a couple weeks, continuing a streak where Pockrass has covered the Daytona 500 every year since 1992. After the news broke, Pockrass tweeted that he was “stoked” for the new opportunity to be at Fox Sports. And if you read through the replies to his tweet, you will read hundreds of congratulatory tweets from fans and media professionals about the move. That tells you how important this was for the sport. Now that he has a new home, we look forward to asking Bob if tracks have lights and seeing him at prerace Tweet Up’s for the foreseeable future.